Minute Maid branches into low-calorie, carbonated juice drinks with the launch of new Minute Maid Sparkling. The new drinks are 6% juice with additional natural flavors with 30-40 calories per bottle (courtesy of a blend of sugar plus zero-cal sweeteners). They are available starting this month in four flavors: Fizzy Lemonade (the name seems a little redundant), Mixed Berry, Tropical Citrus, and Fruit Punch. 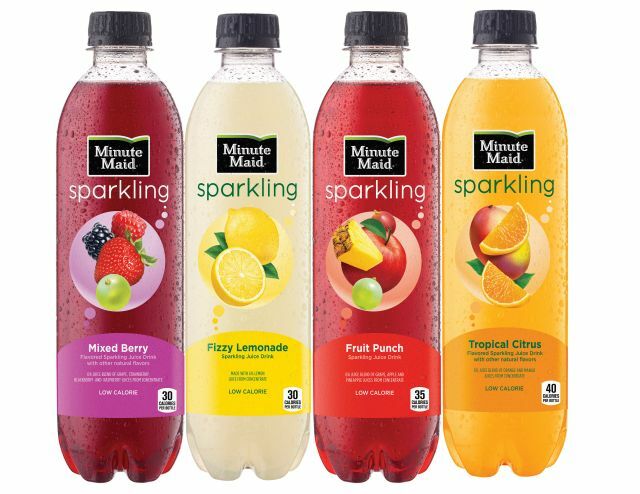 Minute Maide Sparkling comes in 16.9-fl-oz bottles with a suggested retail of $1.29.